Something really fab happened to me during the week. I got a lovely letter from Britmums, saying I had been selected as a #MorrisonsMum! They were giving me a generous amount of Morrisons Money, or gift vouchers, to put it another way, to spend in store on a fabulous Bank Holiday banquet! I was ridiculously excited at this prospect, as it combined two of my favourite things, shopping and doing something special with the family. No, not the wine! Although that was a lovely sight too, I bought two bottles of red and quite a lot of beer for the boys! 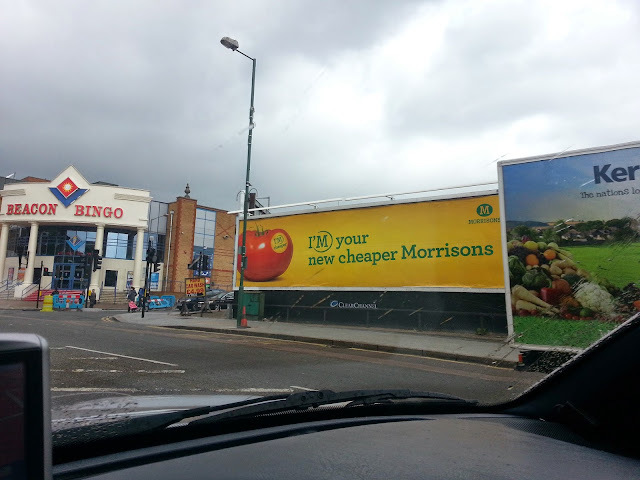 No, I'm talking about the new, cheaper Morrisons. You may be aware of this too. Some of the signage has been a little less subtle! The thing I like best about Morrisons is the meat counter. The butchers (and they are proper, qualified butchers) are really friendly and always happy to answer questions about the products. Even the silly ones I think of! 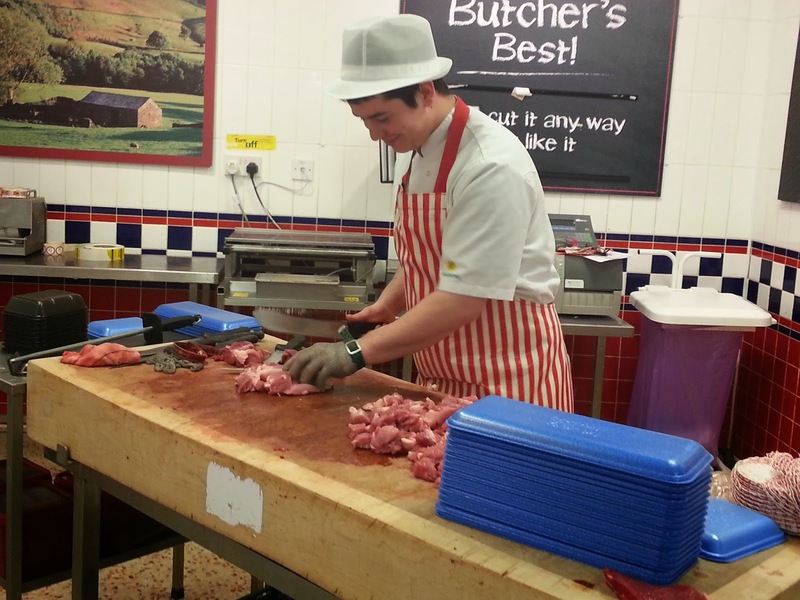 Here is an example of a Morrisons butcher hard at work. He was very, very embarrassed that I took his picture, but his colleague thought it was a great idea! I think he's doing a grand job. 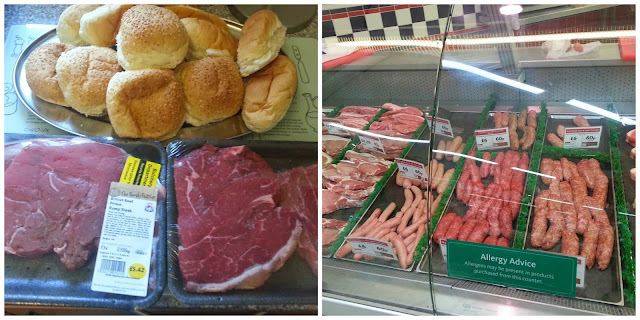 At the counter we bought some fresh Cumberland sausages and rump steak that was huge! Hard to believe it wasn't from a T Rex! The photo on the left shows the mahoosive steak. I left the burger buns in the picture for scale. They weren't that shape when I bought them. I think I need to go to bag-packing school! By the way, can I just reiterate, these are normal size buns, not ultra-modern, nouvelle cuisine micro-buns or anything! They were really huge steaks! I also found some delicious looking fresh beef burgers. I'm very fussy about burgers, but these looked very appetising. As I said before, I had to go back for the bread rolls and pudding... Well, I say had to. I suppose I didn't really have to buy pudding, but when cakes look like this, they are bound to fall in your trolley, aren't they? 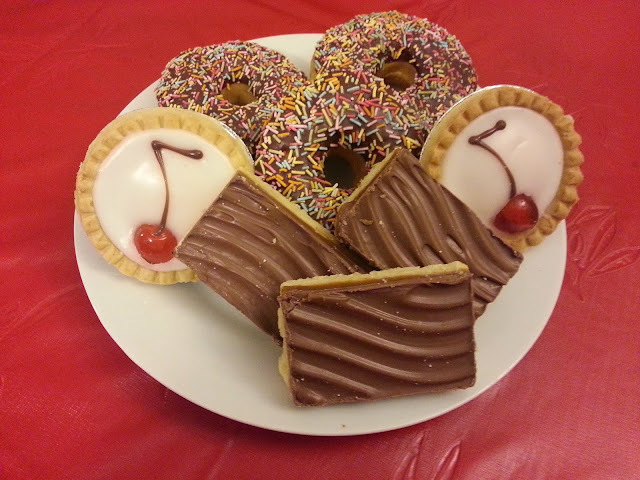 Morrisons bake all their bread instore and hand finish their cakes, to give them a really special touch. It's not just my opinion either, the Baking Industry Awards crowned them 'In-Store Bakery Retailer of the Year', and in most stores you can watch these craftsmen at work and judge for yourself! There's nothing like the smell of fresh bread and it's really hard to leave without any when you smell it baking instore. I didn't mean to cheat, I had a plan, honest! I just got a bit distracted by the smell of fresh bread, and all the delicious cakes and sort of forgot. But all was not lost! You see, I'm well used to forgetting the main purpose of my shopping trip, so I am, at least, adaptable! Cue a quick rummage through the cupboards, and... Behold! Meditterranean Pork Kebabs! 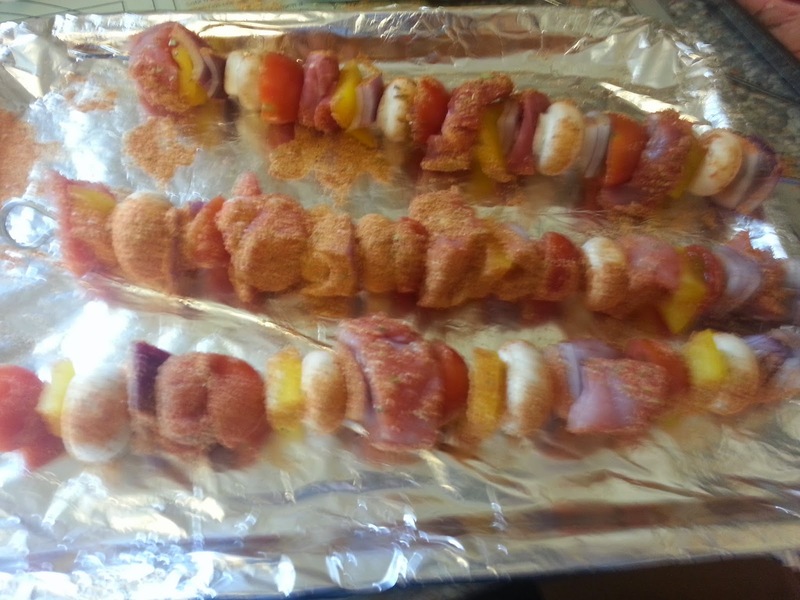 Take a kebab skewer and add equal amounts of cubed pork, halved mushrooms, halved cherry tomatoes, and similar sized chunks of red onion and yellow pepper. Realise you have no seasoning, rummage around in the cupboard and hopefully find a sachet of Coleman's Season and Shake Meditteranean Chicken mix. Scatter the mix all over your assembled kebabs and barbecue liberally. Cost: Around 33p, per person. So, that was my Morrisons. 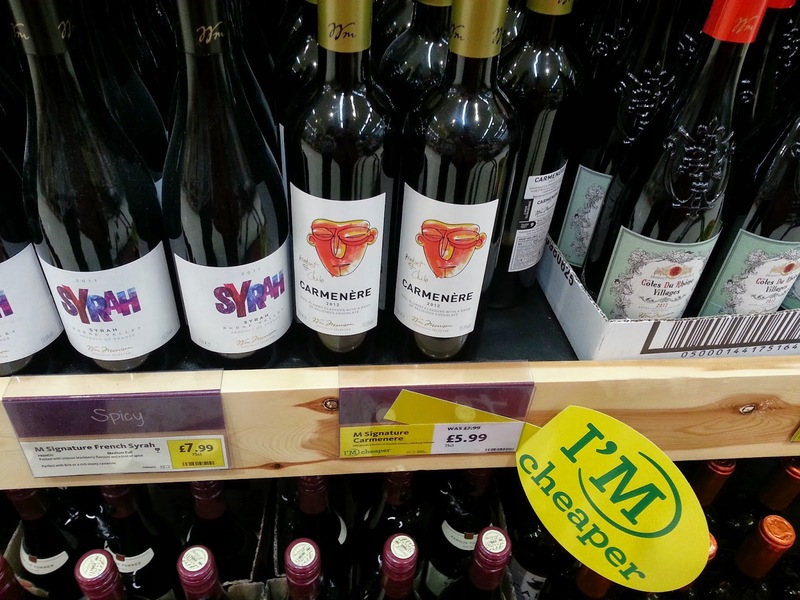 Cheaper, still great quality, and lots and lots of variety. Pop along to your Morrisons and see what's new, I challenge you to leave without any bread! The display of meat looks really fresh. I have to say I really loved Morrisons when I went recently too.